As more and more people discover TypePad, we're often asked for a list of best practices for getting a great blog up and running. And while our Knowledge Base has all the information you'd ever need about how to use TypePad, we were lacking a simple "ten step" guide for getting the most out of your TypePad blog. Until now, of course! 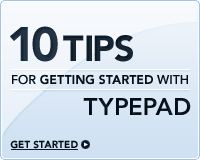 Introducing getstarted.typepad.com, our Ten Tips for Getting Started with TypePad. It starts with some simple advice on getting started in private, moves through customizing your design, setting feedback preferences, publicizing your blog, various ways to post to your blog, adding photos, video and audio, and tracking your success over time. We'd love for everyone who's using TypePad today to take a read through, and let us know what we can improve. Are there things we can add to the guide to make it better? Are there things that you think a new user should know to get the most out of the product? You can comment on the site, of course - so feel free to leave ideas there. A quick note to inform you that we'll be rolling an upgraded version of TypePad into production this afternoon. The upgrade will be invisible to you, but it will help us continue to grow and scale TypePad to meet your needs. We'll be watching TypePad very closely, but if you see anything unexpected, be sure to file a help ticket and we'll investigate quickly. Unrelatedly, some of you may have noticed a brief blip in TypePad around noon pacific time today; one of our Internet service providers was having routing issues, which was preventing certain users from reaching TypePad. We quickly diagnosed the problem and shut that ISP off, and things returned to normal. As always, you can follow TypePad's status at status.sixapart.com. Yesterday I had the pleasure of chatting with Debbie Weil, author of The Corporate Blogging Book, for our series of podcasts with authors who blog on TypePad. Debbie was gracious enough to spend 20 minutes with us to talk about why business are blogging, who's doing it well and to pass on some advice to business that are just getting started with blogs. You can listen to our conversation here, or you can grab the 9.5mb file directly. This is our fourth TypePad podcast; hopefully we're getting better at these! Our apologies to the intrepid users who tried to tune into our Skypecast with Debbie last week; to simplify matters we went a bit more "old tech" for this week's conversation. If you're interested in subscribing to our amateur radio experiments in iTunes or another favorite audio player, you can grab an RSS feed of just our podcasts from our friends at Odeo. Here at TypePad HQ we're very excited about today's introduction of the Treo 680. We've been working closely with Palm to make sure that TypePad Mobile works well with this new version of the popular smartphone, and we're thrilled that the (colorful!) 680 will soon be available from a mobile provider near you. TypePad Mobile makes it easy for you to post photos and entries to your TypePad blogs and photo albums with just a few clicks. But TypePad Mobile isn't only available for the 680. It also works with the popular Treo 650 and 700p, and versions of the application are also available for Windows Mobile and Symbian Series 60 devices. You can learn more about the application here, and can download and install TypePad Mobile directly to your mobile device from get.typepad.com. If you're hungry for news on Palm's announcements, two of the best Palm communities are right here on TypePad: Treonauts and Palm Addict. So be sure to visit them for the inside scoop on the 680! Debbie Weil is a well-known corporate blogging consultant, author of The Corporate Blogging Book and our featured author for October at books.typepad.com. She blogs on TypePad at BlogWriteForCEOs.com, where she covers the ins, outs, ups and downs of business blogging. We're very pleased to be hosting a moderated Skypecast conversation with Weil this Thursday, October 12th at 2:00 pm PDT to talk about her book and best practices for businesses that are blogging. To participate, all you need is Skype and this link: skypecasts.skype.com. If you can't join us, don't worry; as always we'll be recording the conversation and releasing it as a podcast just a few days later. Update: We had some technical difficulties with the Skypecast this afternoon, and we apologize for that! We're going to record an old-fashioned podcast with Debbie and release it as soon as possible! For everyone who tried to join in this afternoon, we apologize. One of the great things about all this Web 2.0 stuff you keep hearing about is just how easy it can be to create compelling user experiences by gluing different services together. Our friends over at Google demonstrated that recently by putting together ajaxsearch.typepad.com, a demo site of some of the great things you can do with the Google AJAX Search API and a TypePad blog. While mashing every single Google service into your blog may not be what you're looking for, it's great to see what's possible. Google's Mark Lucovsky built demos on his TypePad blog of integrated web search, blog search, video search and even mapping. We love seeing creative uses of our Advanced Template Set functionality, and Mark lays out on his blog how you can implement the solutions he built.